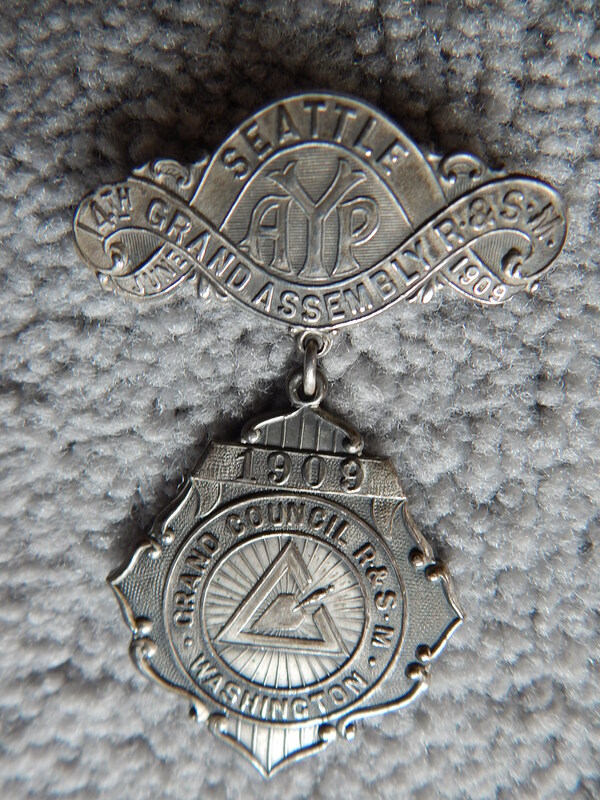 AYP was the first Worlds Fair in Seattle. 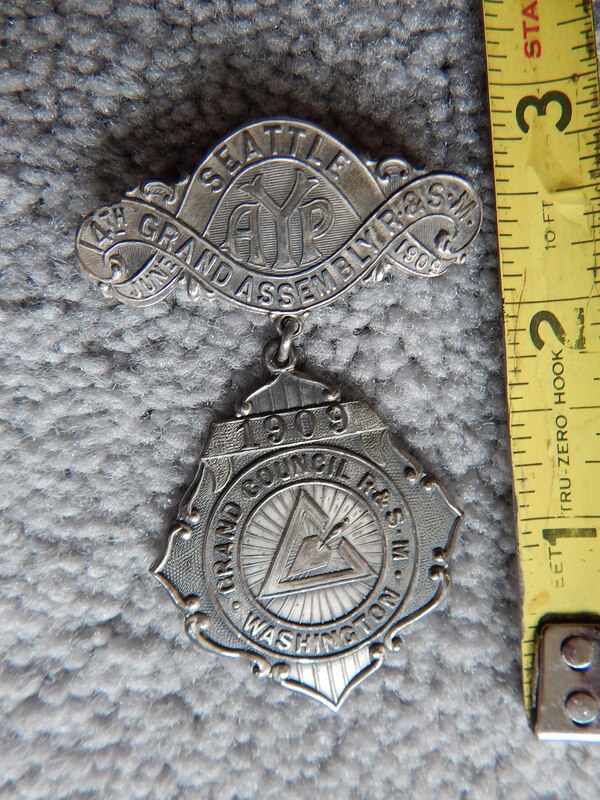 It was hosted at what is now the University of Washington campus in 1909. 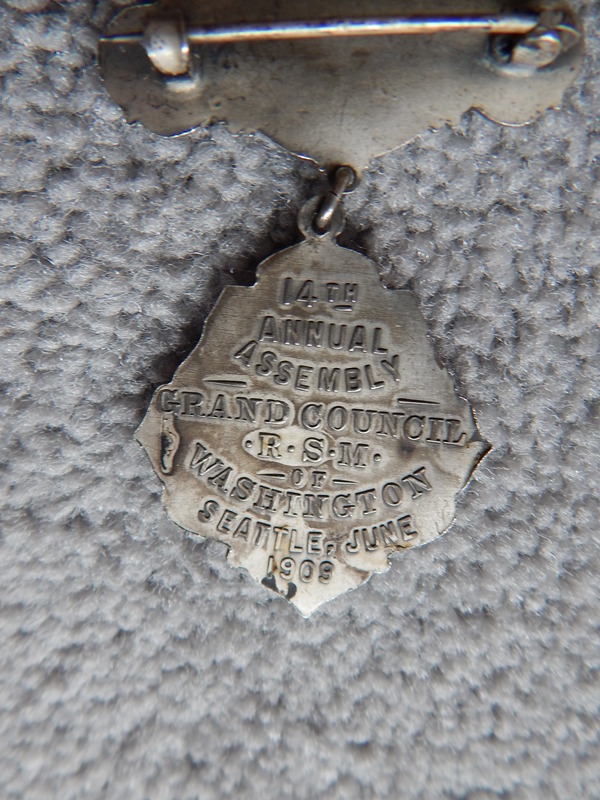 It was originally going to be in 1907 to commemorate the 10th anniversary of the Klondike Gold Rush but Jamestown Exposition was that year, so Seattle postponed. Apx 3.7 million people attended the event. 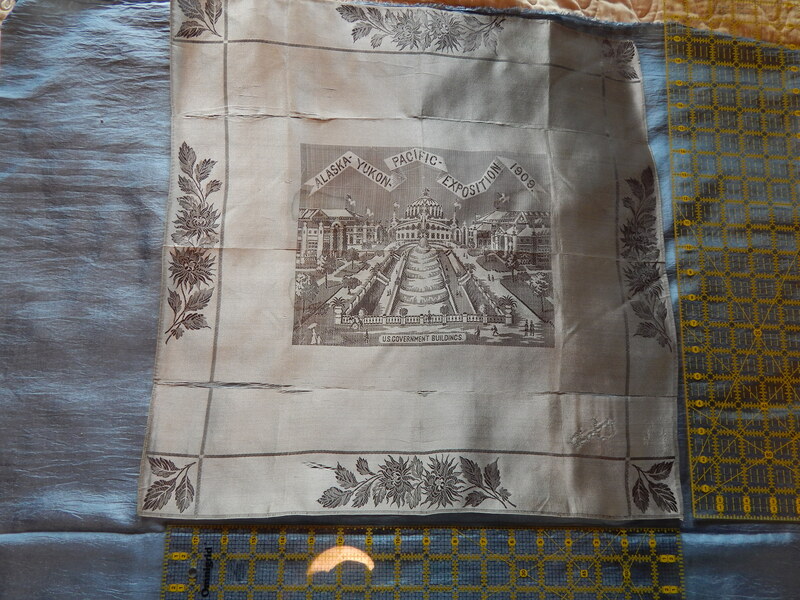 This treasured momento was a silver silk scarf that our fair goer had her name embroidered on it. We know her as only Gaby. 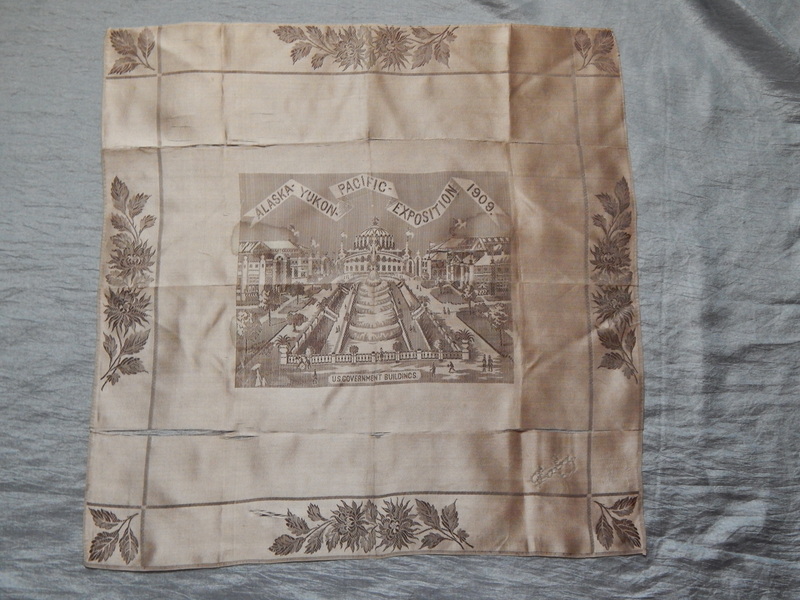 The scarf has a picture of the US Government building as the center of the motif. 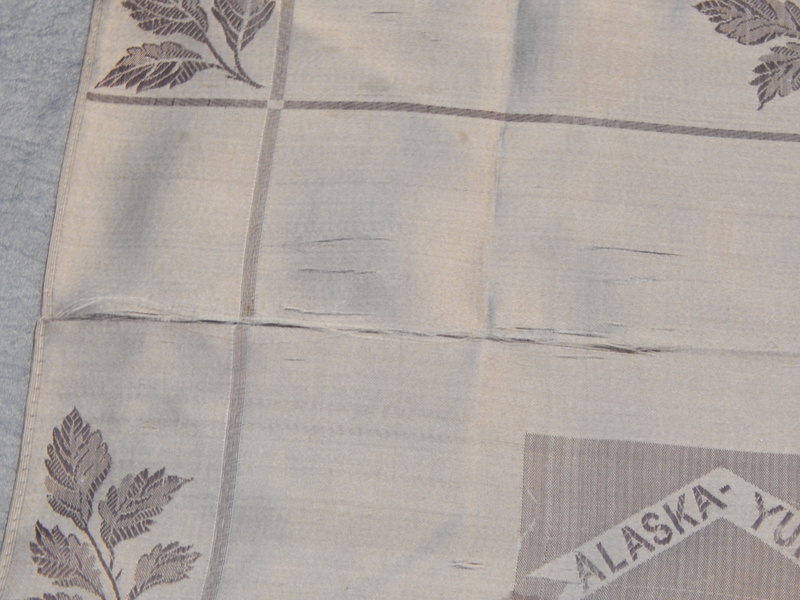 The scarf was probably left folded for over 100 years and this contributed to some of the condition issues it has. 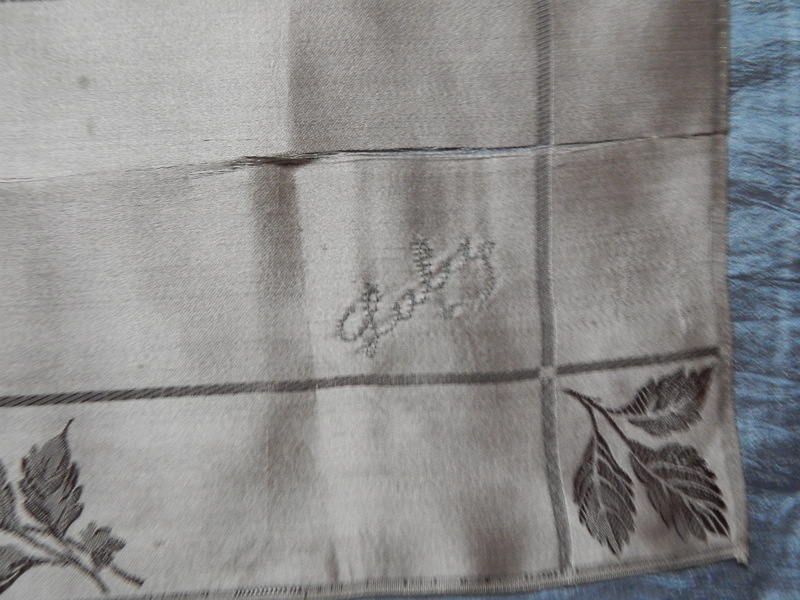 Also, the type of silk it was made of combined with creasing has created tear like areas in the fabric. This is often called shattered silk. Wiki gives us this nice explanation of what that is. In some cases, the textiles are weakened not by outside causes such as light or pests, but by chemical reactions taking place within the fabric itself, such as the oxidation of iron-based mordants over time. One example which is cited frequently throughout the literature is the case of “shattered silk.” During the late nineteenth and early twentieth centuries, many silk manufacturers treated their fabrics with metallic salts (usually containing tin and iron) to give them a heavier, more luxurious feel. However, as these fabrics have aged, the metals in the fibres have accelerated their decay and caused them to become extremely brittle. The shredded or “shattered” effect this causes is the reason for the name. In this case, the environment of the textile contributes very little to the deterioration from the metallic salts, though exposure to light may accelerate it even further. Here is one last shot of the scarf with rulers so you can see it’s size a little better.